Well, Winston, I'm pretty sure you did a better job than the fellas below. 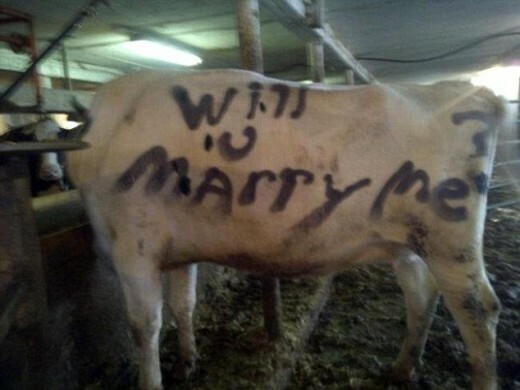 Never mind that saying, why not buy the cow to express your love for the milk? Er, um that didn't come out right. Must have been the hormones. 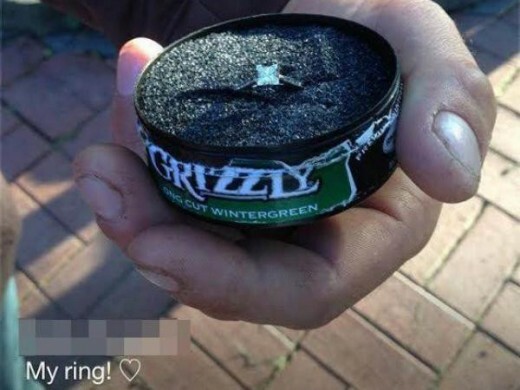 Nothing says classy like a can of Grizzly dip with a ring in it. Methinks the future holds a mouth with a bit of cancer in it, too. In sickness and in health, right? Awww, look how easily that ring will glide right onto her finger. That's not gross at all. The four food groups: bread, cheese, meat, and love. This guy is a thrifty lil' feller. 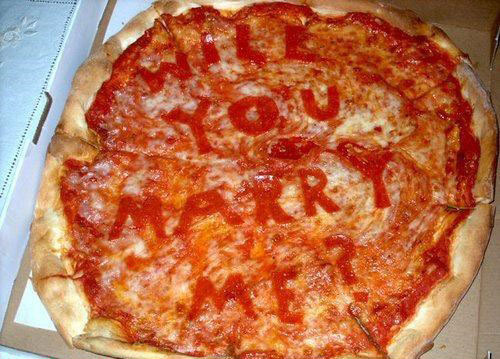 Going all frozen pizza Casanova Chef on her. I hope you paused Netflix to say yes. 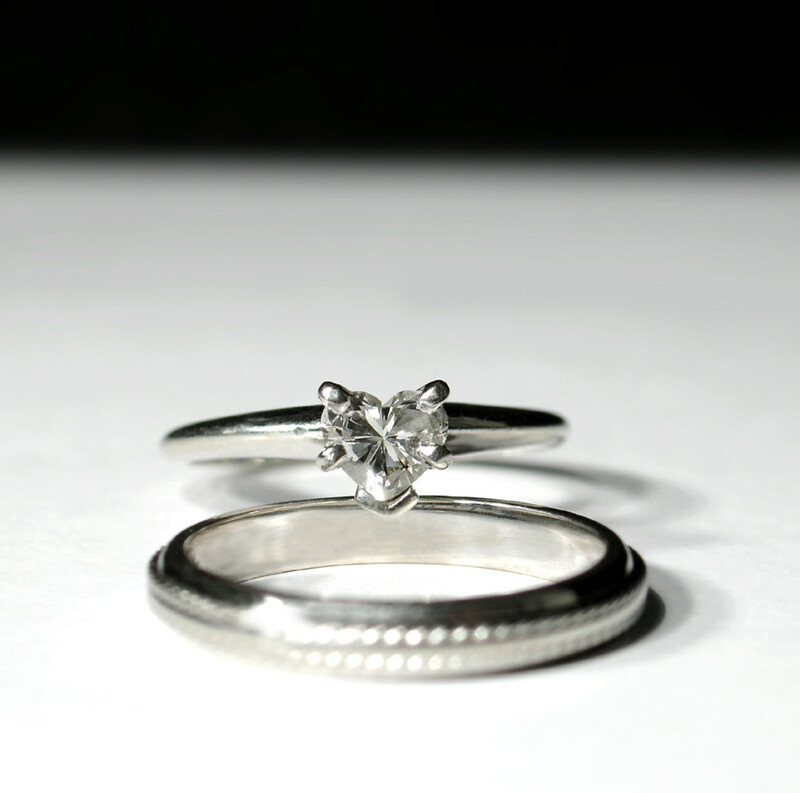 For a six-piece and a ring. 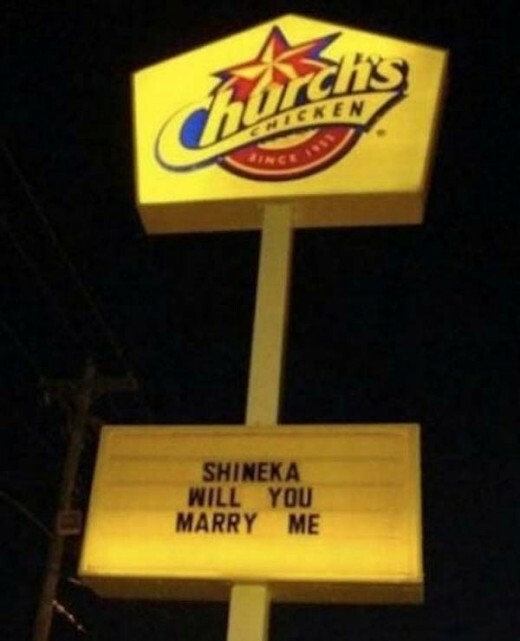 Shineka, you are one lucky 'chick'. 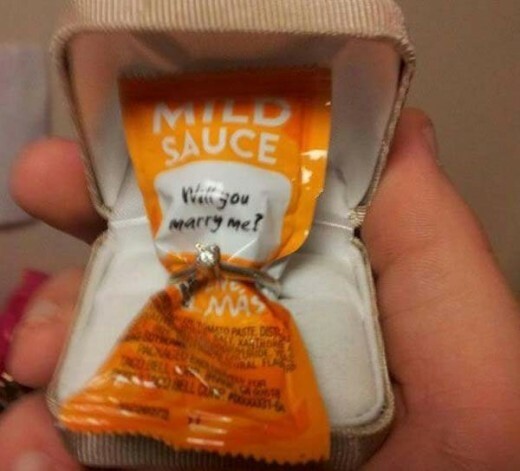 Mild sauce for a mildly creative approach to proposing. For those who don't want to 'think', just go South of the Border. I'm thinking this guy has only seen her a couple times-- through her window. Who does this? 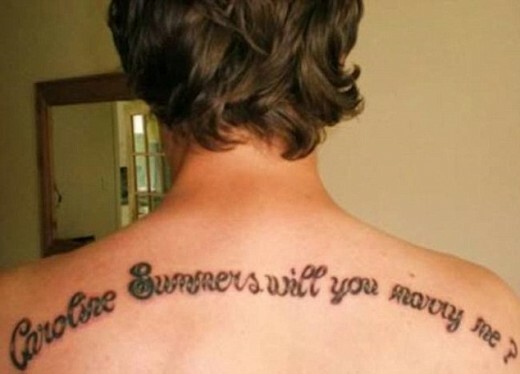 So does a tattoo......and a no. At least the wrist tattoos are reusable. Smart thinking, for a dummy. They say ignorance is bliss. You clearly are very 'merry'. It's not HPV, it's a ring. Now it's your turn. Share your stories. 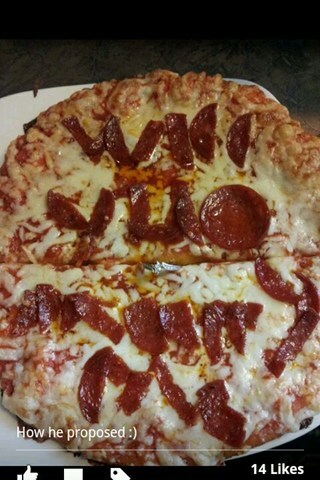 Have your proposals been this classy and creative? Or, did this list inspire your upcoming proposal? Praytell in the comments below. I read about a ring that was put in a hot dog at a buffet picnic. 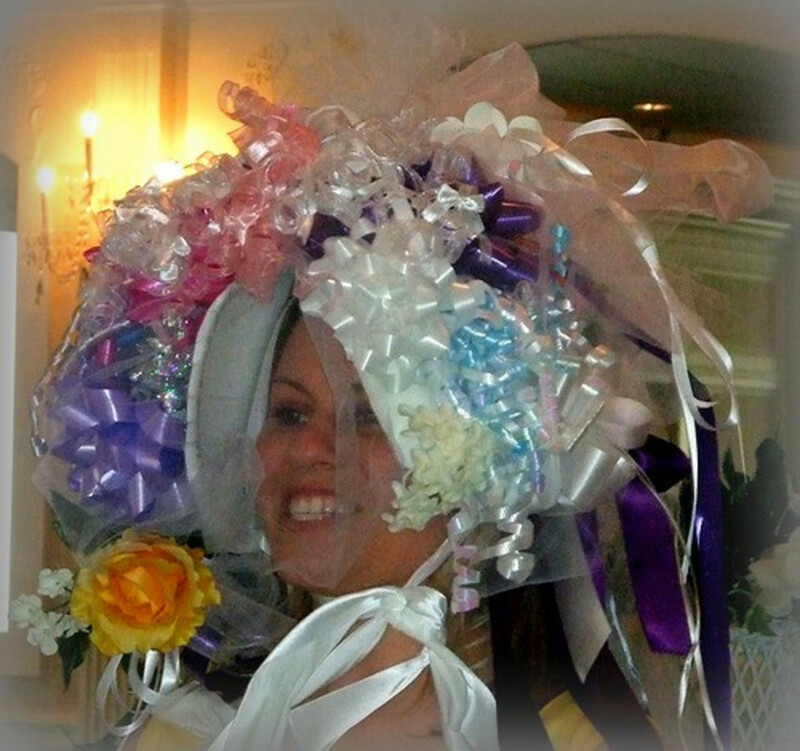 The bride said yes. I'm right there with RJ Schwartz. Avoid gimmicks and crowds. Take her/him to a romantic setting- ocean at sunrise/sunset, a private candlelit dinner, picnic at an scenic overlook at mid-day. 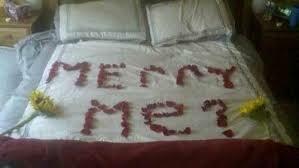 Have a nice ring in a nice box, get down on one knee if your health permits it. "I love you. 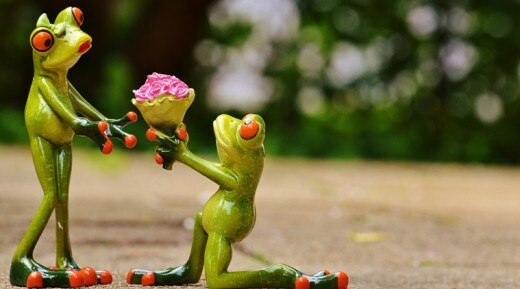 Will you marry me?" No long intros, no bells, no whistles, no jokes, no begging, no skywriting, no giving the proposal to the caller at a square dance. No writing it on her new car in shaving cream which can ruin the paint. This was a really fun hub though. 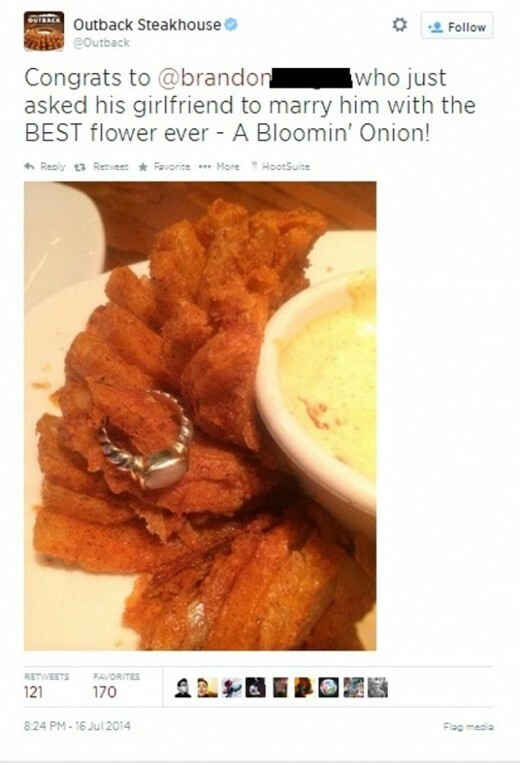 Something about the blooming onion was even more cringe-worthy than the poor painted cow or the dip can. MizBejabbers, Except for the actual myocardial infarction, it is a wonderful story. 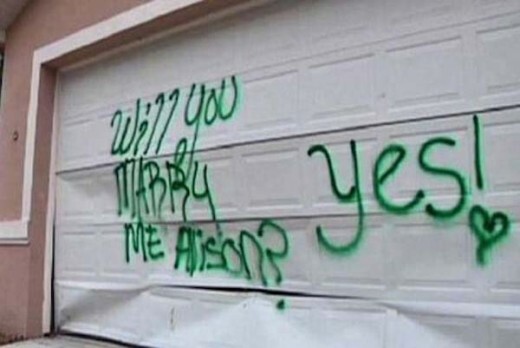 If only such acts of kindness were the cornerstones of every marriage. My proposal to my wife was of the romantic planned type (balcony of a hotel room overlooking the ocean on Grand Bahama island...) This was a great compilation and I'm still smiling - thanks for sharing it. These are funny, except for the last one, which was icky. 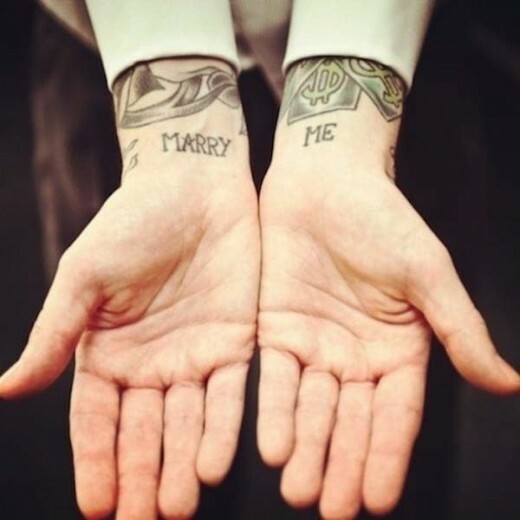 Re: the tattoos Even if she says "yes" the tattoos are backdated, so that's a lame idea. We had been dating only six weeks when it occurred. We were on the lake when a gust of wind turned over our rented catamaran. After we righted the catamaran and recovered as much of our stuff as we could, including my boyfriend's pants and only one of his shoes, he started having chest pains. (We were in bathing suits and he had brought his clothes on the boat) Anyway, I took him to his doctor's office not the emergency room, wet pants, shirtless, one shoe, and all the embarrassment of sitting in the waiting room half-dressed. The doctor immediately hospitalized him with a suspected myocardial infarction. Yup, it was a heart attack, and he remained in the hospital for over a week. One day he made the sincere statement that he didn't know how he was going to manage after he was released. I rounded up his friends and, without his knowledge, they moved him out of his rented house into mine. He was shocked, but he seemed pleased at the same time. We lived together for nearly a year before we finally married. There was no proposal that I remember. We kind of drifted into making it permanent. As I told one of my single girlfriends how to catch a man, "Give him a heart attack, move him in and then you've got him!"